Think with your heart and prepare to die for you have been Chosen. The land of the Forest Dwellers has been decimated by the Horde under the watchful eye of the vilest of all creatures, Teeleh. Thomas Hunter, supreme commander of the Forest Guard, is forced to lower the recruitment age of his army from 18 to 16. From among thousands, four new recruits are chosen to lead--and perhaps die--for the greater good. It's been thirteen years since the evil Teeleh has laid waste to the beauty of Elyon's creation. The Horde roams the desert-filled earth seeking to destroy the followers of Elyon that remain. Thomas Hunter is the commander of the Forest Guard, warriors who have given their lives in service to Elyon and fellow believers. The Horde greatly outnumbers the Forest Guard, and Thomas is reluctantly forced to encourage sixteen and seventeen year olds to fight. Out of this group four have been chosen by Thomas himself as special leaders: Johnis, Silvie, Darsal, and Billos. These new recruits are sent on one last training mission to prove their worth to Thomas and the Guard. They soon discover there is an even greater mission in store for them, and the survival of Elyon's followers depends on their success. They must seek out and collect the legendary Books of History before they fall into evil hands. Along the way Johnis discovers that not only was he born to lead, but his destiny is greater than he could have ever imagined. Ted Dekker is one of the most prolific and successful CBA authors to date, and with the beginning of this great new series he only continues to elevate his status. Chosen is an extraordinary tale that builds upon the unforgettable world Dekker created in Black, Red, and White. Adventure, action, and suspense abound, and the world and characters of Elyon are rich and skillfully fashioned. The subtle connections to Dekker's previous works are a clever and fun addition to the enjoyment. Chosen is being marketed as Young Adult Fiction, but young and old alike will enjoy this latest offering. Dekker fans will love this new story from the Circle universe and new readers will undoubtedly be sucked in to the greatness that is Ted Dekker. This is a superb beginning to what is sure to be a fantastic series. Have you ever read Ted Dekker before? Can I say, "I loved this book!" I have not read any other Ted Dekker book except for "House" and that was co-written by Frank Peretti whom I have always loved (didn't love "House" though, it was okay, but really out there). So I wasn't sure if I'd be into "Chosen" at all or not. Surprisingly, I was blown away by how creative and engrossing it was and I could not put it down... literally from start to finish I was sucked into this parallel world that Ted created. All I could think as soon as I was done was, "When can I read the next one???" It says that it is Juvenile Fiction on the back of the book, but seriously, it's kind of like the Hollywood Nobody books in that aspect - I must be a juvenile at heart then because I love it! Join the legions reading "Chosen" and find out! Just when we thought we knew where Ted was headed in his career, just when we were ready to pigeonhole him, he breaks out with another fantastic series. This is not a cheap spin-off of the Circle Trilogy, or another way to cash in on that series' success. This is great storytelling. The story introduces us to Johnis, a young man who is still trying to understand his place in the Forest Guard. He knows his community is threatened by the nearby Horde, but he and the others have lost their deeper understanding of the good and evil forces that encircle them. They've become lackadaisical in the thirteen years since the Circle Trilogy ended, and they follow their leader Thomas based mostly upon the old stories. Soon, Johnis and three partners are thrust into a battle for their very lives, racing to fulfill an assignment from Thomas, while also fighting off the bat-winged Shataiki. Johnis is given his own specific quest, and he is forced to either rise above his own limitations or fall prey to his youth and inexperience. I discovered Ted's writing at the beginning of his relatively short, but prolific, career. I still think "When Heaven Weeps" is one of the best Christian novels out there, and "Thr3e" broke barriers in the market. When he wrote the Circle Trilogy, we had only hints at the larger mythos he was creating, one which ties together his last ten books or so. While I loved the allegory and depth of "Showdown," I found "Saint" and "Skin" to be more movie-script oriented--not bad, just different. "Chosen" is a return to the deeper exploration that I've come to expect from Ted's stories. Despite being immensely readable and aimed at the YA audience, this is a story older readers can also enjoy for its fantasy elements and for the spiritual ideas that ring throughout. I'm anxious now to read "Infidel." And if these are any indication, "Adam," his next full-length novel should rank among his best. Dive into another world again! Did you know this is a young adult book? I didn't, until I read it. I kept thinking it was written for a younger audience, lacking the maturity of the original Trilogy, and then I saw on the back cover that I was right. For a young adult series, it's not at all bad. However, one can not even begin to understand this series without having first read the original Circle Trilogy and its sequel, Showdown, which are definitely not young adult fiction. I can't quite grasp why an author would try to change his audience in the middle of a storyline. Don't get me wrong; for young adult fiction it's a good read. It's just not cut from the same block as the other relevant works. Ancient Faith and Hope...NEW STORIES!!! Man, who does this Ted Dekker think he is? First the "Circle" stuff, then he gets a little deeper, and now he's coming out with "Lost Books!" Ok, I'm hooked. That's just it with Dekker. You read him once and enjoy it, and you're a forever fan. And just because this might possibly have hints of "The Circle" hinting at the cover, that doesn't mean it is the same story. Or is it? Make no mistake about it, Dekker isn't about making another project and turning into his own little cash cow. Not at all. But he does take an ancient faith and hope, and gives us some new stories! I like that. Have you ever lost the spring in you step? Felt that what you once fought for isn't worth fighting for anymore? There is a sense of this, and it shows in the Land of the Forest Dwellers. And four people, four young people, are chosen. But do they even know what they have been chosen for? Johnis is one of these chosen ones. Did Thomas Hunter make the right call this time? Are these the kind of warriors Elyon had in mind? You can probably expect this to get just a little bit crazy! Watch out for the darkness that will tempt from time to time. Beware of the temptation to run and hide. Don't expect the obvious. Expect it to hit you like a karate kick! When it does snap your head back, get back up, and keep fighting!! You should know by now that Dekker doesn't write something that isn't worth reading. This was worth reading. Can four teenagers really save humanity if they throw everything to the wind to follow their hearts? Johnis believes so. And so does Thomas Hunter, supreme commander of the Forest Guard. It's been thirteen years since the Colored Forests gave way to desert. Elyon's followers now live in seven scattered forests, each forest containing a lake of life-giving water which the forest dwellers depend on to fight off the dreaded skin disease of the Horde. But the skin disease isn't the only danger Elyon's chosen people face. The Horde army is now 400,000 strong. Word has reached Thomas Hunter that the Horde plans to attack from the east in four days time. With only 20,000 eligible Forest Guard fighters left, Thomas is forced to lower the recruiting age from eighteen to sixteen in order to boost the Guard's ranks. Of the new recruits, four are hand picked by Thomas to become squad leaders. Before Johnis, Darsal, Billos, and Silvie can receive their commission, they must undertake one final test. Thomas sends them on a mission that takes them to the edge of the desert on the west side of the forest, but it soon becomes clear to Johnis that the west is not as safe from the Horde as Thomas thought. Johnis must make an agonizing choice when he unexpectedly meets with creatures long deemed as legend. Can he really turn his back on Thomas and the Forest Guard to follow his heart? Can he convince Silvie, Darsal, and Billos to follow him deeper into the desert in search of the six missing Books of History while keeping their mission a secret from everyone, including Thomas? The answer to these questions can be found in the pages of Chosen, book #1 of Ted Dekker's new Circle Series. Building on his successful Circle Trilogy, Dekker reintroduces readers to the world they came to love in Black, Red, and White. The battle between good and evil continues as Elyon's chosen are pitted against the Horde and the Shakaiki once again. The lovable Roush, who remain committed to helping and guiding the forest dwellers, also reappear. Although the Circle Series will be marketed as Young Adult novels, older readers need not worry. Dekker is in his element with this new tale. His talent for creating memorable characters and alternate realities merge to make Chosen a book that will appeal to all ages. The main characters in this series may be teenagers, but their struggles are timeless and universal. Forest life has forced them to enter adulthood earlier than today's society. Not only is sixteen marriageable age, but now they are required to protect their villages in combat. Their decisions will shape their future, and that of all humanity. Their story explores themes which include following your heart, the search for truth, and yes, the enduring battle between good and evil. Already acquainted with Dekker's alternate reality? Your mission is to journey forward from the Circle Trilogy and embrace the continuing battle unfolding against the Dark One. Unfamiliar with Roush and Shakaiki? Your mission, should you choose to accept it, is to pick up copy of Chosen and enter a reality that, under the skin, is much like ours. The army stands poised to attack. Thomas Hunter must prepare and train four more leaders to defend against the enemy outnumbering him ten to one. The game is on. the players didn't know anything about it but Thomas called it football and the winner was going to be one of the leaders. One young man small in stature and a nonparticipant in the game undenounced to him or anyone else in the crowd ends up with the ball and takes it to the end zone. Thomas chooses the four and one is the small young on the sidelines. Not even Thomas knew what that would lead to and the tale has just begun. The chosen one finds himself on a special mission not for Thomas but for someone he thought was no more than a mythological creature. Between the mission, the secrecy, and following the orders of Thomas the four are whirred through a string of events that should take there life. The action never stops and the pressure never releases. I was so excited to see these books coming out! I spent most of one morning reading "Chaos" and most of the next day reading "Renegade." Just when you think you've got it figured out, Dekker throws a twist in and you're in the thick of it again. Heart racing, pulse pounding--don't sneak up on me when I'm reading Dekker--I may scream. Prolific author Ted Dekker once again demonstrates his superior skill at weaving in multi-level themes, character profiles and belief systems, all framed within an action-packed dynamo of thrilling chase, fight and escape scenes. In CHOSEN, the first installment of the Lost Books series, Dekker has the famed Thomas Hunter inciting his forest dwellers to fight for the chance to win one of four top leadership positions. As an unlikely candidate because of his size and interest in books, Johnis doesn't think he has a chance. But by using his mind and his heart, he outwits and outfights other choice warriors and is appointed one of the four to go on a mission issued by Hunter. With little to recommend himself, Johnis is at first ridiculed by his fellow warriors, who see little worth in this upstart. Together, Johnis, Darsal, Billos and Silvie head toward the desert and the Horde. En route, Johnis begins seeing signs of the evil bat-like mythical creatures, the Shataiki, swarming in the trees above their heads. They are attacked and divided, and all too soon are confronted by Teeleh, the originator of all evil and instigator of much pain against Elyon's people, the forest dwellers. Johnis must try to save his comrades and trick Teeleh into setting them free in exchange for one of the seven lost books of history. After gaining help from the Roush, the pure-hearted bat-like counterparts to the Shataiki, all four warriors get further lessons in listening to wise counsel and not going off task because of fear. After almost dying due to lack of cleansing in the fresh water, Johnis, Darsal, Billos and Silvie do manage to join together with the aid of the Roush and rescue two of the seven books. Each of the teens gains much insight and fortitude as they re-enter their forest dweller camp and report on their mission. Hunter sees something special in Johnis and predicts his rise as the leader of his people. Dekker concludes CHOSEN on a high note of community rejoicing and celebration, but hints that the second installment will have the four heroes relying on every ounce of skill, cunning and heartfelt courage to meet their next challenge. Riveting and fast-paced, readers will find the Lost Books series up to the author's usual excellent standard. This story begins in the middle! Actually in the middle of the trilogy, during a period when Thomas Hunter eats the fruit so that he doesn't dream. This series introduces a brand new cast of characters to Ted Dekker's trilogy with Darsal, Billos, Johnis and Silvie, four teenagers assigned the task of finding the lost books of history by the Roush. I have read almost everything ted dekker has written and his circle trilogy is some of my favorite dekker material. Chosen is a great book that begins a great series, filling in some time between the original trilogy books. Right away you fall in love with the main hero and his companions. The story is fast and the plot sweeps you away, desperate to know what happens with all that is at stake. Johnis' world has been all but destroyed by a terrible plague that turned the land to desert and most of the people into the disease-ravaged Horde. Only the seven forests surrounding the seven lakes protect the Forest Dwellers from the same fate. Because of the Horde's constant attacks on the forests, the leader of the Forest Dwellers, Thomas Hunter, has been forced to lower the recruitment age for the Forest Guard to 16. Johnis wasn't chosen to be one of the thousand new recruits to the Forest Guard -- too small for his age -- but by a twist of fate, he is chosen to lead them. When he and three other leaders set out on their final test to prove their characters, their mission takes an unexpected, but preordained turn, and Johnis discovers that his fate may already have been decided. 'This wasn't the threatening man-beast, nor Horde, but Johnis couldn't breathe anyway. Something was very wrong. The man wore a shirt made from thin fabric with writing across the [...], and fitted blue pants. Leather boots -- but not the dress of a warrior. More than his dress, the man's demeanor was out of place. Rather than walking like a skeleton in the desert, this man looked healthy. As if he'd had all the water he needed. The man motioned to the dune behind him to the right. "There's a killer forcing us to play a game. I need you to help me find the cops. Tell them to get to the library. It's all about the library, tell them." The story insinuates that the leader of the Forest Dwellers, Thomas Hunter, is also from our world, but much to my disappointment, that story line never goes anywhere. Turns out, this is part of a much larger series, which I didn't realize until I got to the very end and saw the advertisements. The ads in the back of the book claim that you can read this series without reading the other, but it explained a lot about my biggest problems with the book: the way Dekker glosses over some of the finer details about his world (probably because he's already explained them dozens of times in his other books), the somewhat thin characterization of his protagonists. In fact, the thing I felt while reading it was that it felt a little like fan fiction: someone was adding a new story to an already established canon, but if you weren't already part of the fandom, you would be a little lost. 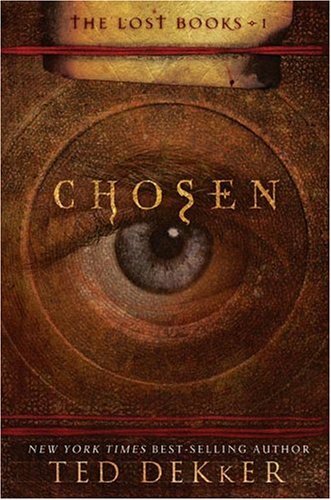 I also found out after reading "Chosen" that the companion series is considered Christian fiction, but I can say right up front that other than some pretty blatant good/evil black/white imagery, I didn't see much allegory in this one in particular. I wouldn't say you have to read the other series before picking up "Chosen," because I haven't read them myself, but I would venture it might make the book a little more nuanced. On it's own, it's a tad flat; a fun adventure quest story without much meat.